I'm not really sure how to review this episode. Did you read my synopsis? That's basically it, folks. Lupin's toilet breaks because Fujiko leaves something in the tank (fortunately, not steaming upper decker). 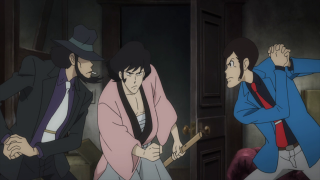 The gang argue over who gets to use the other one (does Goemon not have his own room?). Then Zenigata drops in when he smells Goemon's cooking and is craving Japanese food. Then Fujiko retrieves the object she was hiding and we discover why she did it (kind of). 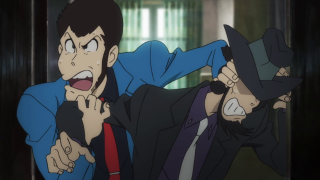 I don't mind watching a whole episode of Lupin and the gang just futzing around, having minor squabbles, doing whatever it is they like to do in their downtime (peeing, apparently, but that's more a biological imperative than a hobby... usually). 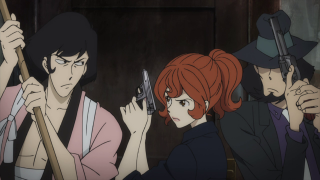 Having to deal with the inconvenience of elaborate disguises just to go to the nearest working bathroom, Goemon's picky eating, Lupin's continued, possibly debilitating affection for Fujiko's frustration that he can't remember some anniversary (of when they met? ), and Pops' contrived appearance at their very hideout simply out of want for Japanese food (a trait he shares with Goemon). No particular heist or threat, just a day in the life. You can almost hear the Seinfeld or Curb Your Enthusiasm themes playing over these scenes. It was a show about nothing. So there's not much meat here, if any. However, I wouldn't take it as being a bad episode, because watching these extraordinary people interact a bit more like regular people (albeit criminal ones who regularly disguise themselves) is just amusing enough to watch a whole episode of. It gives us a little bit of intimacy that we don't get from most episodes of this franchise, a sense that we might really get to know who these people are on a casual level. There's no big insights into their character, just the fun of seeing them be people, rather than course-runners. Also, Fujiko's naked for some of it. Bewbs, lulz. I think my favorite part is easily Goemon's desire to make noodles for Japanese-style food, and Zenigata's appreciation for a simple indulgence from home. Obviously, the gang couldn't let Pops know that it was Goemon Ishikawa XIII that prepared the food, but our favorite anachronistic samurai was interested in hearing how he did. 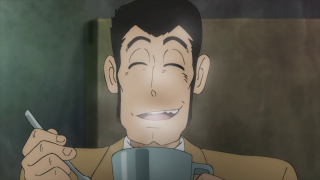 When he asks Lupin what the good Inspector thought of it and Lupin responds with the great review, you see Goemon actually smiling, pleased in his craftsmanship. Sometimes Goemon is the most adorable of the lot, even if he is overpowered. It's a rare moment of humanity that this typically stoic swordsman is visibly pleased by such a small thing. By the way, what *was* in that box? 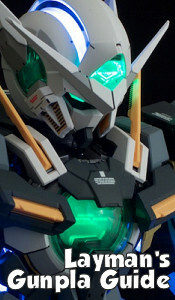 Some kind of anniversary gift? 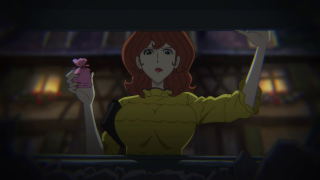 I guess Fujiko retrieved it because Lupin didn't even open it and just threw it out. Oh well, next year, Fujicakes. But anyway, next week looks like a Jigen episode where he squares off with another gunman, which has me pretty excited.